There was great news on the Android front this week. Samsung reported blow-out earnings, with smartphones -- the majority running Android -- accounting for nearly three-quarters of profits. 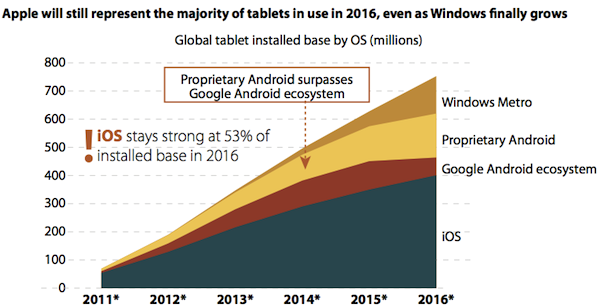 Meanwhile comScore data spotlights the growing US Android tablet market. Additionally, Google started selling Galaxy Nexus direct, with no carrier contract, for $399. But all three share something in common -- what they foreshadow. Google has lost control of Android, and must swiftly act to regain it. 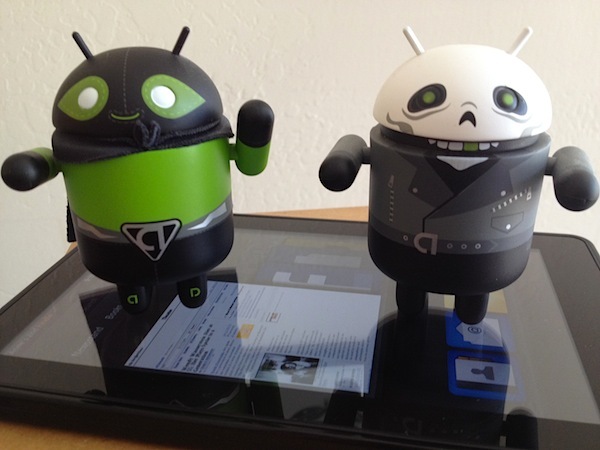 Forrester Research predicts that proprietary Android will surpass the Google Android ecosystem by 2015. Stated differently, Google's open-source mobile platform risks fracturing into multiple fatally fragmented Android ecosystems. Not one but many. There is little time for Google to demonstrate decisive leadership that can keep the ecosystem largely intact. Only a miraculous Google I/O developer conference can take back Android, but challenges remain. Big ones. Google's problem: Two partners are overwhelming successful, while the majority limp along, and one hurts the entire Android ecosystem. Apple is now the least of concerns. Putting Amazon and Samsung in their place is more important. In February 2011, Nokia CEO Stephen Elop wrongly called Symbian (and Meego, too) a "burning platform". The term better applies to Android on tablets, where Amazon's Kindle Fire is in process of burning down the ecosystem. I've repeatedly warned this could happen. In December, I explained how Google's forthcoming tablet would be a year too late, as Amazon fills the leadership vacuum left by the search and information giant. In March, I focused on the Amazon problem in context of the broader Android platform. Earlier this month, I explained that, contrary to some popular punditry, Google's forthcoming tablet is more about Amazon than Apple. comScore data released Thursday deeply troubles any future Android ecosystem analysis. Amazon started selling Kindle Fire in mid November. By end of December, the tablet already had captured 29.4 percent US share, putting it head of the Galaxy Tab family (23.8 percent). Over the following two months, Kindle Fire took sales from every other Android tablet, ending February with stunning 54.4 percent market share. 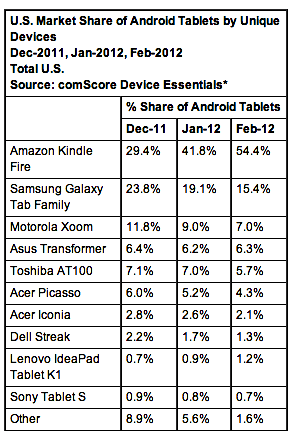 Tab family ranked second followed by Motorola XOOM, with 15.4 percent and 7 percent share, respectively. Other numbers also forebode. During fourth quarter, Android tablet share reached 44.6 percent, up from 32.3 percent three months earlier, according to IDC. Kindle Fire largely accounted for overall Android share gains. Looked at differently, two tablet makers, Amazon and Apple, accounted for 71.5 percent of shipments. Stated another way, the majority of tablets shipped during fourth quarter run iOS and Amazon Android. I make an important distinction, because Amazon has largely customized Android, right down to the web browser and offers its own app store. The retailer is building its own ecosystem separate from the larger one Google leads. Amazon's objectives are contrary to Google's. For example, if I type the web address to Google Play into the Silk browser on my wife's Kindle Fire, Amazon's Android app store opens instead. On other Android tablets, Google Play is default but there is option to sideload from other stores, including Amazon's. Kindle Fire's continued success is good for driving up Android shipments against iPad, but it's bad broadly, coming at the expense of the larger Android ecosystem. Amazon's success is blueprint for other Android licensees, particularly as tablets spread across the planet. Forrester Research sees tablets displacing and eventually replacing PCs, with iPad market leader in most geographies, including China, for at least four more years. Tablet shipment compound annual growth rate will be 46 percent through 2016, when global number will reach 375 million, up from 56 million last year. The analyst firm predicts install base of 760 million tablets, compared to 2 billion PCs. "Forrester believes that emerging markets will account for 40 percent of tablets sold in 2016, and that Apple will do well in these markets due to strong product and brand appeal", Gillette observes. "Despite Android plays from low-price local vendors such as eBen, as well as the retail footprint of Lenovo, Apple market share in China will remain above the global average. Even in 2011, 17 percent of metropolitan Chinese online adults 18 and older reported owning a tablet, versus 11 percent of US online adults". What that means: There will be as much, if not more, competition among Android tablet makers than with Apple. That's good for customer choice but risks fracturing Android into multiple ecosystems. Microsoft prevented this with Windows by, for years, limiting how much OEMs can customize the operating system. Android's open-source license, and Google's listless leadership, allows OEMs incredible freedom, and perhaps too much. Amazon uses that freedom wisely, as do other tablet makers -- and even more so smartphone OEMs (more on that in next section). Unlike other Android tablet manufacturers, Amazon takes complete control over the entire stack. Kindle Fire features the aforementioned Amazon-customized version of Android 2.x, its own Android app store, music and movie stores, ebook store, web browser and customized media consumption software and services. Sony is closest, followed by Samsung, among Android tablet manufacturers. Amazon is creating a curated experience that matches Apple's and, in some respects, exceeds it. Consumers can buy Kindle books for Fire, but read them on their iPhone, Android handset or other device. Amazon allows movies and music on Kindle Fire or other devices. From Apple it's just devices supporting iTunes Store. People buying into the Amazon lifestyle get Kindle Fire plus something else. That's an added benefit not available from Apple or other Android tablet vendors -- okay, Sony is closest. Amazon prioritizes features and pricing that matter for living one digital lifestyle around its cloud-connected services, rather than offering the latest, hardware and software. Like Apple, Amazon offers a stack of content and services. Kindle Fire isn't about techie features but a digital lifestyle around Amazon products and services. Other OEMs are sure to imitate Amazon's success, which really copies Apple's, by doing much more than just skin Android, as Samsung does today on tablets and smartphones with TouchWiz UI. Samsung, not Google dictates, the Galaxy Tab user experience. Not surprisingly, many users upgrading Galaxy Tab 10.1 to Android 4.0 (aka Ice Cream Sandwich) can't much tell the difference, because TouchWiz UI is so pervasive. Samsung also offers a curated experience, just not as deep or as leveraged (because of Amazon.com) as Kindle Fire. Samsung's huge success with Galaxy Note, first on smartphones and potentially tablets, is foundation for yet another vertical Android platform, with customized apps and competing ecosystem. That's great for competition and customer choice, but not necessarily good for Android. Still, Samsung is a bit player in the tablet market compared to Amazon and Apple -- even with first-to-market advantage over Kindle Fire. But in phones, Samsung is king. During first quarter, the South Korean electronics giant broke Nokia's 14 year reign as global handset market share leader, according to IHS iSuppli and Strategy Analytics. The latter firm puts Samsung ahead of Apple in smartphone shipments -- 44.5 million to 35.1 million. Samsung offers three operating systems -- Android, homegrown Bada and Windows Phone. The majority of Samsung smartphones ship with Android, customized with TouchWiz UI, and led by Galaxy S II variants' stunning sales success. Next week, Samsung plans to launch its next flagship smartphone in London, presumably further outclassing iPhone 4S. Like tablets, Samsung, not Google, controls the user experience on all but the Nexus series smartphones. At least Samsung adopts the newest Android eventually, unlike Amazon, but TouchWiz skinned. So those international Galaxy S II owners lucky enough to get Ice Cream Sandwich upgrades won't see much of it behind Samsung's skin. Samsung does make Galaxy Nexus for Google, but shipments aren't great -- nor broader upgrades from this and other OEMs. According to official Google stats, just 2.9 percent of Android devices, including tablets, ran ICS on April 2nd. Updating is where Google's Android control is weakest, and where the company lacks leverage to offer uniform experience across devices or to assure they have the latest OS version. Verizon is shocking example of what's wrong. The nation's largest carrier started selling Galaxy Nexus in December, but has since fallen behind updating what's supposed to be a "pure Google" phone. The moniker refers to Android without alteration, and also promise of frequent and fast upgrades. Verizon Galaxy Nexus owners aren't getting them, unlike users of the HSPA+ international models. This week, Google engineer Jean-Baptiste Queru put doubts to rest about who's to blame: "The part that blows my mind is that some variants of the Google-engineered flagship devices still haven't received Ice Cream Sandwich (or are stuck with older versions of Ice Cream Sandwich) because of delays introduced by operator approvals". Samsung isn't exactly rushing either, based on Android 4.0 update schedules released this week -- nor HTC and Motorola. Samsung and HTC have little incentive, as they get more benefits from skinning Gingerbread and using that, additional apps and cloud services to differentiate phones between them, among other Android licensees and from iPhone. Android 4.0 is many ways classier than iOS 5. ICS feels more fluid and modern, but few people get to experience it. What's that saying about a tree falling in the forest? Few people can appreciate Google's good work or ICS advantages if they can't get it, or if they do, have a skinned experience. Google is right to sell Galaxy Nexus direct, particularly with Verizon shunning updates and limited carrier adoption (here in the United States, no AT&T or T-Mobile). Punditry fills the InterWebs about Android fragmentation. The problem is bigger: Platform fracturing into competing ecosystems. That's a scenario Google should seek to prevent, but the success of Amazon and Samsung push that direction. Google could take full control of Android, by not releasing future versions to open source and changing licensing terms. 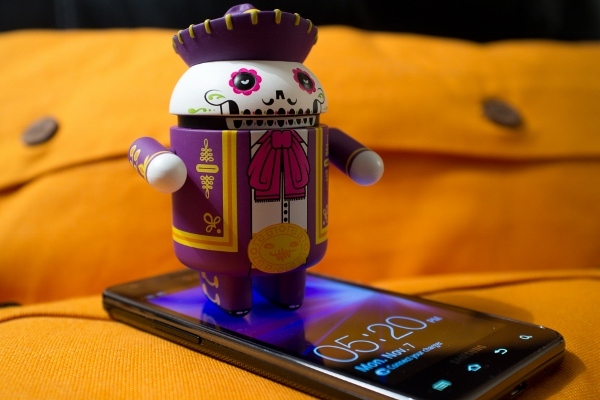 The logic: Android is too big to fail, that OEMs would have no other choice but align their customized platforms with the broader Android ecosystem. But so doing also risks alienating Android licensees willing to go elsewhere. For example, Google wouldn't want to lose Samsung, which can fall back on Bada and Windows Phone. I see the search and information giant moving down another path, and it's perhaps riskiest of all but with the biggest potential payoff. It's what the company should have done long ago. Renaming Android Market to Google Play, Ice Cream Sandwich's tighter ties to broader Google services -- G+ among them -- and greater cross-integration of cloud and search services, with social as center, is part of a larger, rebranding effort. What Amazon does right, like Apple, Google seeks to do: Sell a digital lifestyle. All roads lead to a heavily branded, Google lifestyle around, search, social and mobile that's good for the company and the broader Android ecosystem. Another piece in place: Google Drive launched earlier this week, and the service is clearly primed for tablets. Like Amazon and Apple, Google also increasingly offers a curated experience. Galaxy Nexus feels like an end-to-end device, even though Samsung makes the hardware. Now that Google owns Motorola Mobility the next Nexus phone may be homegrown. Certainly the Nexus tablet should be, whether or not it is. Google may not unite the overall Android ecosystem but at least provide a place for the smaller licensees and swath of other partners to find stability -- even if Amazon and the like offer fractured platforms. There is plenty more Google could do to excite developers and other partners, and lift the market to the newest Android version and in process take control by demonstrating more leadership. If not, Android's biggest enemy won't be iOS, but itself.